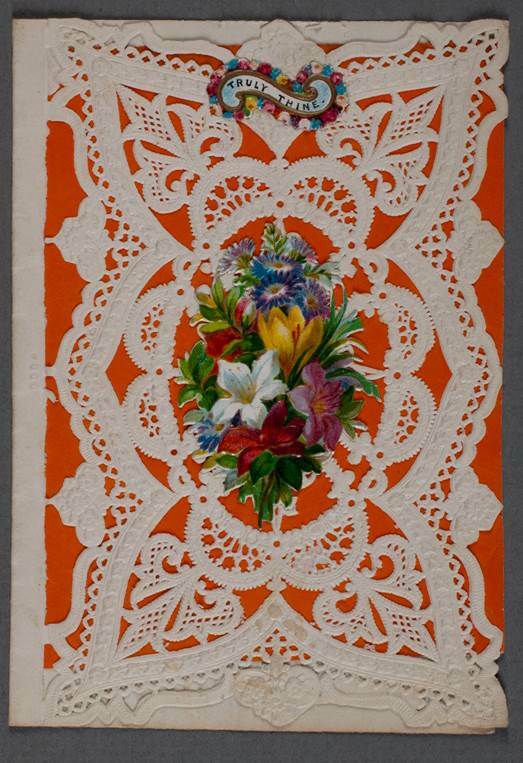 The American Antiquarian Society has a collection of over 3,000 valentines ranging in date from the 1830’s to 1900. The collection includes both manuscript and printed designs, with a strong representation of locally-produced cards made in Worcester. Chromolithographed cards published in Boston by Louis Prang & Co. can also be found in the collection, along with other brightly printed designs by large American and European producers. Exchanging valentines became quite fashionable in America in the 1840s. In 1846 over 30,000 valentines passed through the New York City post-office on a single day (February 14th). In the midst of this craze for valentines, Esther Howland, known as the Mother of the American Valentine, opened her business in Worcester, Massachusetts. She set up a work space in the family home, staffing it with a few local girls to help fill the orders. Her sales quickly reached $75,000 a year and she stayed in business for 30 years. You can learn more about Howland and the AAS collection in our online exhibition “Making Valentines: A Tradition in America" and Past-is-Present blog entry. The Valentine collection is divided into printed valentines, manuscript valentines, comic (or vinegar) valentines, and boxed valentines. There are finding aides available for parts of the collection. For access to the valentine collection, please contact our Readers' Services department or the Curator of Graphic Arts, Lauren Hewes. A descriptive inventory for the general valentines collection is available as a pdf. A descriptive inventory for the manuscript valentines in the collection is available as a pdf. In addition, Manuscript valentines are available through the Society's digital image archive. A checklist for the 19th century comic valentines in the collection is available as a pdf. In addition, 19th century comic valentines are available through the Society's digital image archive. A descriptive inventory for the boxed valentines in the collection is available as a pdf. In addition, boxed valentines are available through the Society's digital image archive.